UNCW researchers are exploring ocean waters off the coast of North and South Carolina in an effort to analyze protection options for marine mammals. William McLellan, a research associate in the Department of Biology and Marine Biology, and marine biology graduate student Laura Murley are among a group of scientists selected to take part in the Marine Mammal Passive Acoustics and Spatial Ecology Project (MAPS). The first of its type in the region, MAPS focuses on offshore and relatively difficult to detect species, including sperm, beaked and sei whales. As a part of the project, scientists will study the animals’ distribution, behavior and habits. On Jan. 17, Murley and McLellan, joining scientists and students from Duke University, embarked on the first leg of a research cruise on the RV Song of the Whale, a vessel designed for cetacean visual and acoustic surveys. The RV Song of the Whale is run by a research partner, Marine Conservation Research International. The research area is within the U.S. Outer Continental Shelf, which hosts some of the highest diversity of marine mammals within U.S. waters. Data collected will be used for smart ocean planning and to strengthen efforts to avoid or limit the impacts these species might experience from human activities like energy resource development. MAPS’ goals include creating a more efficient regulatory process. Biologists and marine biologists will work with the North Carolina Aquarium at Fort Fisher and UNCW MarineQuest to develop outreach and education materials about the science being conducted during the research cruise. MAPS is also working with scientists, leading high-tech developers and citizen science experts from Aarhus University, a public research university located in Aarhus, Denmark; Conserve.IO; and WildMe to create an app to provide vital data and better engage the maritime industry. This project is funded by Bureau of Ocean Energy Management as a cooperative agreement with UNCW. 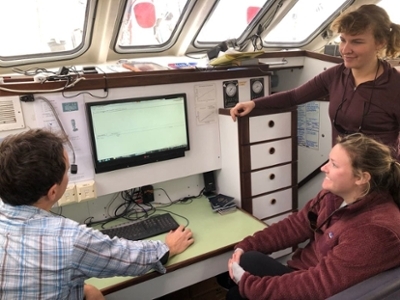 Marine biology graduate student Laura Murley (sitting) learns about passive acoustic monitoring and data recording methods on the RV Song of the Whale. Standing is Elle Heywood (Duke University) and teaching is Oliver Boisseau, a lead scientist of the RV Song of the Whale.